Chop the onion into large half moons and fry in 1 tbsp of the oil until soft and golden and sweet – about ten minutes. Remove the onion to a plate to give yourself space in the pan for the steak. Tip in another tbsp of olive oil and the tsp of butter (the butter gives great flavor, the oil stops it burning) Throw in the rosemary sprig to flavor the oil. Put the onions back into the pan. 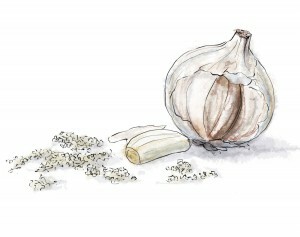 Grate in one clove of garlic and cook for another minute.